I love being able to incorporate the holidays into our homeschool lessons. 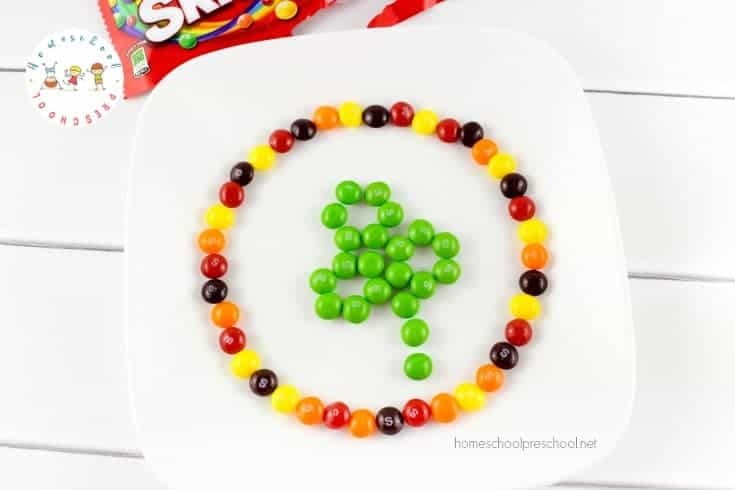 This easy Skittles experiment is perfect for St. Patrick’s Day! Sometimes, it’s nice to take a break from the norm. Put the text books and worksheets away for a day (or even just one subject) and do something new. When the holidays roll around, it’s fun to find activities that incorporate the holiday while teaching at the same time. When you can incorporate holiday can into your homeschool lessons, it’s sure to grab your student’s attention. Whether you’re looking for ways to use up leftover Halloween candy or the Skittles left behind by a leprechaun on St. Patrick’s Day, candy science is sure to keep kids of all ages engaged! This science project is super easy, and only requires a few supplies. Line all of the skittles colors (except green) around the inside edge of the plate. A white plate works best so kids can see the full effect of the experiment. 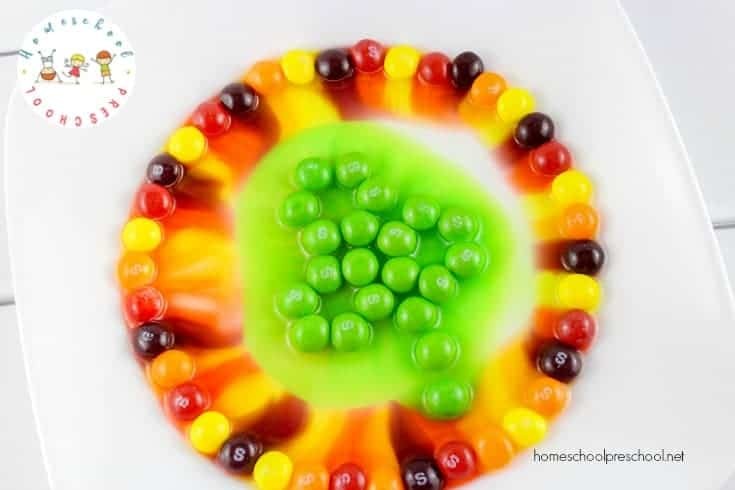 Using the green Skittles, make a shamrock shape in the center of the plate. Pour HOT water onto the plate very slowly. 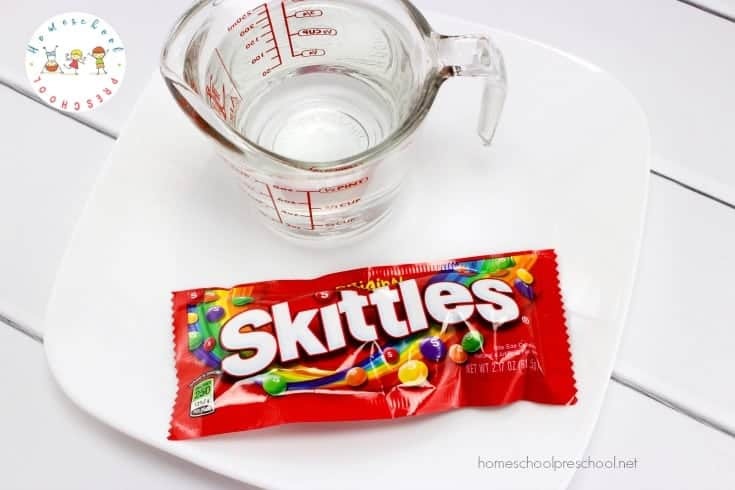 Use just enough water to coat the bottom of the skittles – about ¼ way up. Sit back and watch the magic happen!!! 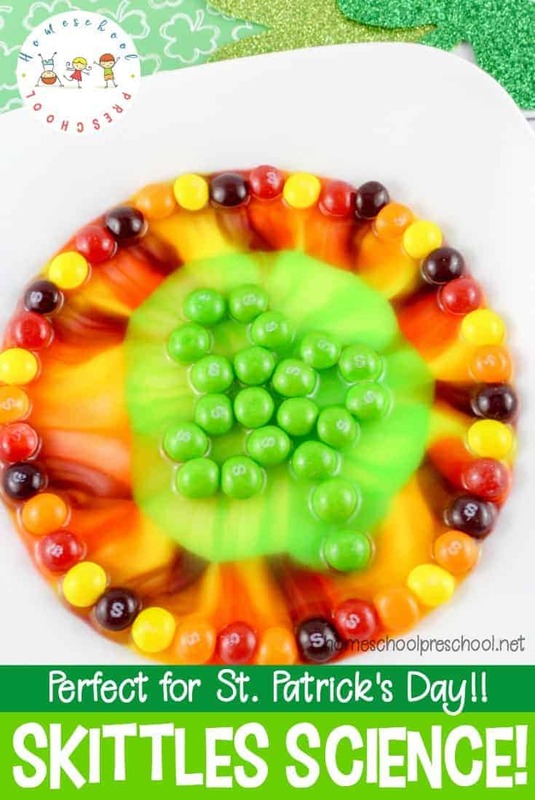 After your kids have completed this activity, try making different shapes with the skittles in the center. Try making a red heart or a rainbow with all of the colors. They’ll love watching the different color patterns emerge. Experiment with using cold water instead of hot water. Compare the results. Have students explain what is happening to the Skittles. Be sure to use the word dissolve in your discussion about the results. 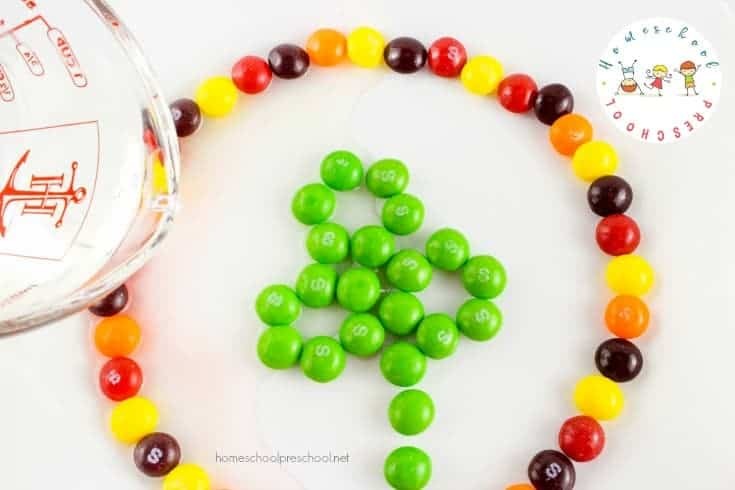 Did your kids enjoy this fun St. Patrick’s Day Skittles experiment? 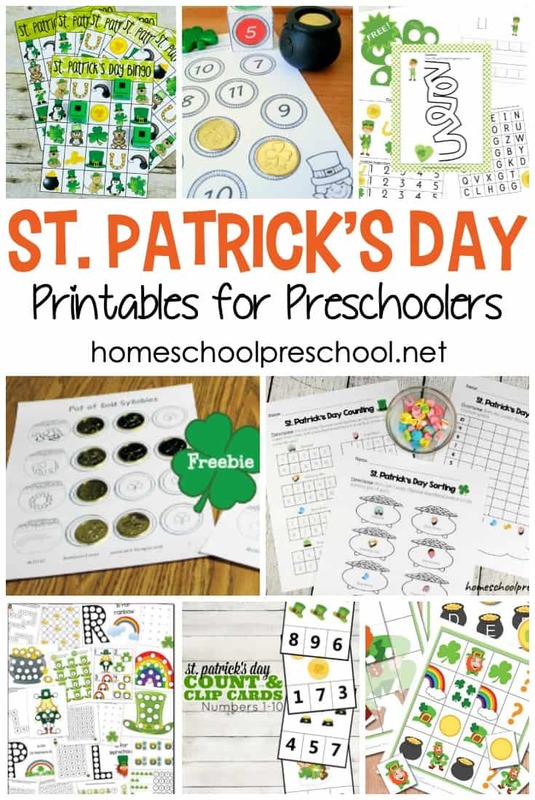 Discover 22 St Patrick’s Day STEM activities that are perfect for preschoolers! Find Skittle science, walking rainbows, catapults and more. The luck of the Irish will be on your side with this amazing collection of St Patricks Day books for kids featuring legends, leprechauns, and lots of luck! 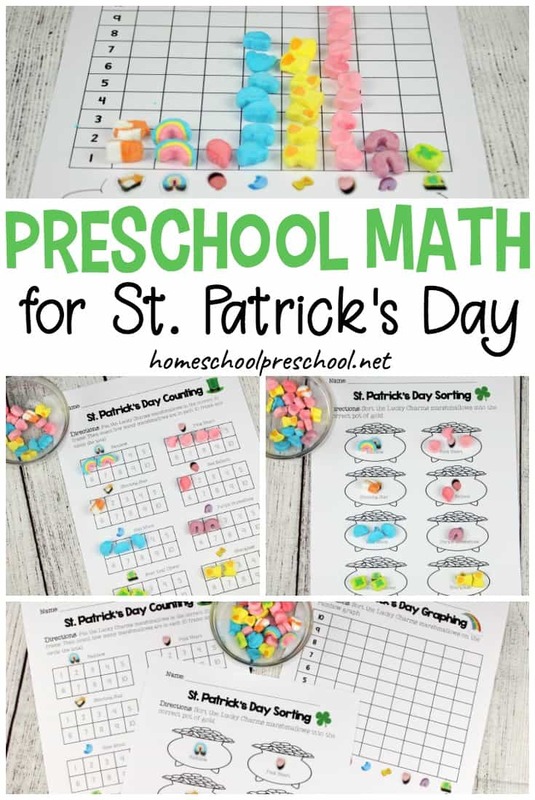 Here’s a fun collection of St Patricks Day goodies and snacks that kids can help you make and then, or course, enjoy! 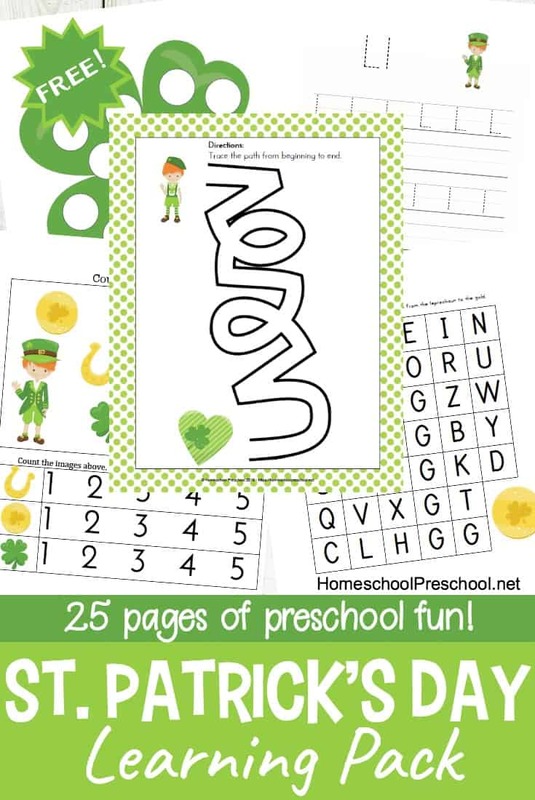 Engage your little ones with one or more of these St Patrick preschool sensory play ideas. Hands-on fun for toddlers and preschoolers!